By Dawn Neuses, dneuses@qconline.com Originally posted here. 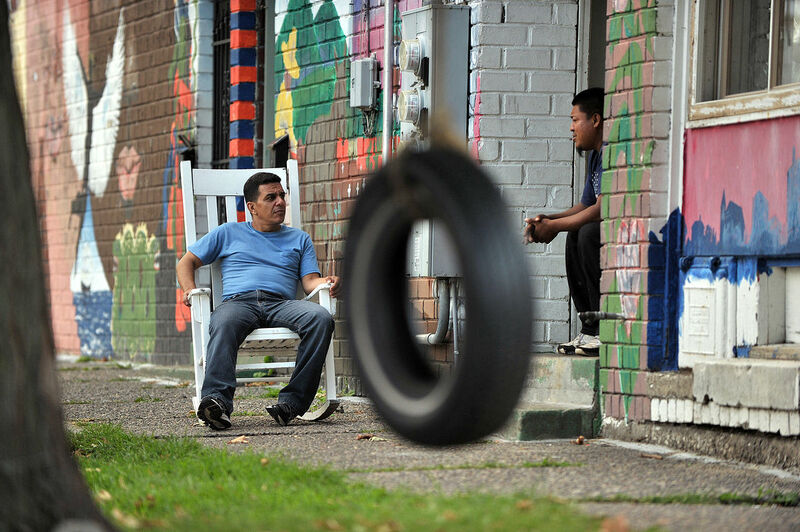 MOLINE — A new project initiated by the John Deere Foundation will place a sole focus on the needs, desires and success of Moline’s Floreciente neighborhood. The foundation has made a grant to the international nonprofit organization Global Communities which, for three years, will work in partnership with the residents, businesses and other advocates to identify and provide what the neighborhood needs to thrive. Mara Sovey Downing, president of the John Deere Foundation and director of global brand management and corporate citizenship, said the idea for such a project initially was sparked in 2011 after the company wrapped up a holiday food basket drive that unveiled the deep level of need in the community. Ms. Downing said Deere & Co. chairman and CEO Samuel Allen remarked that everyone felt great about volunteering for a weekend and they helped many people — but how could the company create meaningful, lasting change. “How do we help people out of poverty and revive neighborhoods?” she said. In the following years, Ms. Downing said the needs of the Floreciente neighborhood became more apparent. The foundation already had engaged Global Communities to help in Deere’s factory communities in Brazil and India, where the nonprofit successfully worked to improve living conditions, infrastructure, skills and employment for those residents, she said. Last fall, the foundation called Global Communities to Moline to work in the Floreciente neighborhood, which roughly spans from the Rock Island border to 12th Street, and from the Mississippi River to 5th Avenue. The 60-year-old nonprofit was launched to focus on community housing to promote social and economic empowerment. For the past 30 years, it has worked internationally and expanded its help to include economic development, humanitarian assistance, governance and urban management, global health and disaster response. It now works in 25 countries and has found success by partnering with people, agencies, organizations and governments. Community engagement is key to every project. “It is about empowering communities,” said Annisa Wanat, Global Communities program director for the Moline office. “We really want to work with the Floreciente community and empower them to get what they need, envision and desire,” she said. “We are going to work on housing, health care, education and work on whatever it is that is needed. “The approach here is to work with the community on the community’s needs,” Ms. Wanat said. Brian English, director of program innovation at Global Communities, said it will have an open-ended dialog with neighborhood residents and businesses. “We want to know what are the things they struggle with the most,” he said. Last October, Mr. English did an assessment of the Floreciente, looking at economic, education and quality-of-life elements. He found the neighborhood is lagging behind. “It is a neighborhood that can use some support, tools and resources,” he said. For example, the median income of Floreciente neighborhood residents is half that of other residents in Moline. Ms. Downing said half of Floreciente residents older than 18 do not have a high school degree. The question then becomes how to help those residents earn a GED or get technical training to increase employment opportunities and earning potential, she said. Ms. Downing said she would like to see the neighborhood association revived or re-created and Floreciente businesses connected to the broader Quad-Cities economy. She also seeks neighborhood beautification, resparked pride and a celebration of the neighborhood’s cultural heritage. Mr. English said many groups, organizations and nonprofits already are working in the Floreciente neighborhood. Global Communities hopes to better coordinate all the efforts to achieve a greater collective outcome for the residents. Mr. English said a lot of the relationship and trust building started this summer. Global Communities has met with organizations and residents already active in the neighborhood and plans to ramp up those efforts over the next three months and hold neighborhood meetings. Ms. Downing said, so far, the residents and groups they have talked to are interested and ask when things will get started. “I think the excitement is building,” she said. On Tuesday, Global Communities will make a presentation at the Moline City Council meeting. Moline’s planning and development director Ray Forsythe said the city has been meeting with the Deere Foundation for more than six months on the project. “I think this will bring the neighborhood together with a stronger focus, and they will look at what is best for the neighborhood,” Mr. Forsythe said.